Two months ago, Gov. Greg Abbott announced a lengthy “school safety plan” to address the tragic shootings at Santa Fe High School. The announcement pacified the immediate call from community leaders for gun violence prevention. But in those two months, Texans have seen no action or leadership from Abbott on the topic — and the biggest concern about his proposal remains unaddressed. In his original plan, Gov. 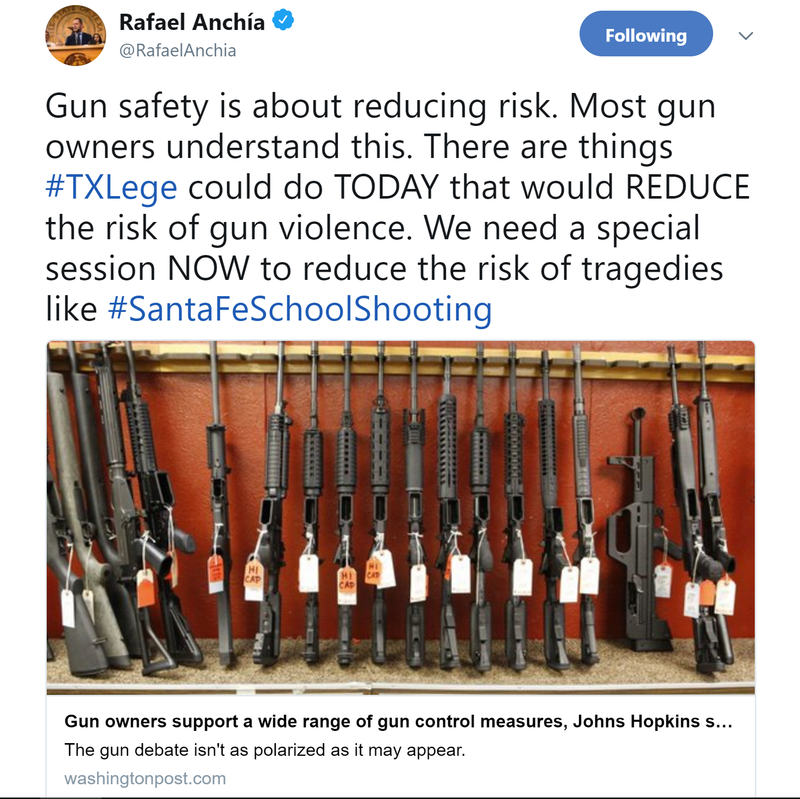 Abbott encouraged lawmakers to examine how “red flag laws” — laws that allow a judge to issue a court order to remove guns from individuals that are determined to be a threat to themselves or others — may be amended during the next session. Chairman Joe Moody held a lengthy Criminal Jurisprudence Committee meeting on the subject that generated positive discussion on how the law could work. Unfortunately, Abbott showed no leadership on the matter. And once Lt. Governor Dan Patrick spoke out in opposition to the policy idea, Abbott — just like he did all last session — deferred to Patrick’s politics and has now signaled he doesn’t see this issue moving forward. Misusing Federal Dollars for School Hardening? As the Caucus laid out in its report on Abbott’s proposal, two-thirds of his suggestions that require funding specified no method of financing at all. And there are still serious questions about how he intends to finance the “school hardening” proposals in his plan. In his plan, Abbott suggested that the state could use up to $62 million in federal grant dollars for “immediate school safety improvements, including school hardening.” However, the grant dollars he identified cannot be used for metal detectors or one-time school facility improvements, a fact that even the Texas Education Agency made clear in the updated grant application instructions they sent to school districts following Abbott’s announcement. How does Abbott plan to pay for safer schools for our students? With billions in the state’s Economic Stabilization Fund, the state has money ready for these kind of one-time expenditures. Would Abbott and Patrick be willing to use those Rainy Day Fund dollars to keep our kids safe? These past two months have left us with more questions than answers. To date, the Santa Fe School Shooting appears to follow the unfortunate cycle of so many other school shootings in recent years — tragedy, outrage, and then nothing of substance from Republicans who are unwilling to support real solutions for gun violence prevention. Texas Democrats are taking action. Rep. Joe Moody continues to push his red flag law proposals. Rep. Canales is exploring legislation to limit the 3D printing of guns, and Rep. Eddie Rodriguez and Rep. Gina Hinojosa continue to meet with student activists who are committed to making their schools safe places to learn. A full list of proposals from House Democrats is listed below. The stakes are too high for us to do nothing. Hopefully, Abbott and Patrick will reconsider their positions on these important issues. 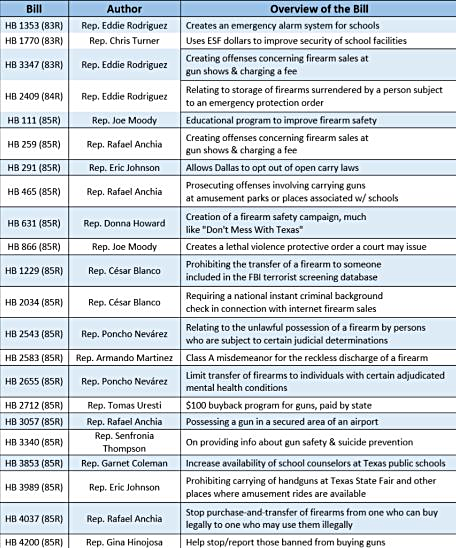 The list above details some of the gun violence prevention proposals members of the Texas House Democratic Caucus have laid out in recent sessions. The Texas House Democratic Caucus is heartbroken about the senseless tragedy in Santa Fe Friday, a mass shooting that left ten people dead and several others injured. We stand together in offering our sincere condolences to the students, parents, educators, administrators and first responders who were affected by this mindless act of gun violence. The roundtables Gov. Abbott has called for are fine – we welcome that discussion. We’ve been ready to have that discussion for a long time, and we welcome our seat at the table to have serious conversations about solutions to the gun violence epidemic in Texas and across this country. However, we have a responsibility also to act and to act immediately to prevent an increase of gun deaths to prevent the loss of more life in Texas and across the country and protect the children of our state. Many members of our caucus have already proposed real solutions. Last session, over eighteen pieces of legislation were filed by Members of our caucus to promote gun safety and prevent gun violence in our communities. Chairman Chris Turner sent a letter to Gov. Abbott and encouraged him to include the Democratic authors of these bills in his roundtable discussions. The Democratic Caucus is ready to act swiftly to better protect all Texans, especially our children. During our caucus retreat last week in Houston, we issued a statement via Facebook Live regarding the Santa Fe school shooting. We appreciate all members who have already shared this video on their social pages.You can watch and share our full statement here. Below is an overview of legislation filed by Democratic members to help address gun violence and promote gun safety. If there is legislation your office filed that you would like to see here, please let us know and we will be happy to list it as we continue to promote and support the efforts of our caucus. Members of the Mexican American Legislative Caucus, the Texas Legislative Black Caucus and other House Democrats wasted no time targeting the legislation. Starting in September, Texas law enforcement agencies could be fined $1,000 a day if they don’t report police shootings to the state in a timely manner. Gov. Greg Abbott on Thursday signed into law a bill that will add teeth to a law passed two years ago requiring departments to report to the attorney general’s office any time an officer is involved in a shooting that results in injury or death. State Rep. Eric Johnson, the author of House Bill 245, said repeatedly during this year’s legislative session that the threat of a fine will ensure the state has complete data on police shootings, a requirement to accurately study the issue in the state.